Reviews | Regal Fine Sea Salt - 8 lb. Regal Fine Sea Salt - 8 lb. Though sea salt is commonly offered in a coarse form to garnish your dishes, this Regal fine grain sea salt is great for cooking! Its fine texture and even consistency is similar in appearance to regular table salt. While regular table salt is mined from underground salt beds and refined, sea salt comes from the evaporation of ocean water. Similar in flavor to table salt, Regal fine sea salt is a healthy substitute that contains trace amounts of valuable minerals that are otherwise stripped from table salt in the refining process! Have been using this for vegetable fermentation. It dissolves easily due to the small crystal size. I had to adjust some recipes that called for kosher salt as this packs more tightly into the measuring spoon or cup. Consistent, reliable, and ready to use in a convenient wide mouth and handled container. Packaging is clear for easy ingredient identification. Regal is the go to standard for staple spices and ingredients. We use this product for a variety of purposes in our restaurant. It holds up well. This is a fine grain so caution is recommended in order to prevent over salting of final product. High-quality salt with a great flavor! This size is a great value. I like using the fine sea salt for baking and recipes where I don't desire the texture of the salt to be noticed. I also use this to fill my tabletop salt shaker at home. This is very fine, which is nice because our former version of sea salt was more coarse. The fineness allows it to blend better into recipes. I was having my salt get blended a little unevenly in my cookies, so this more fine version from Regal will correct that. We do plan to use this for everything, as we normally do with sea salt; I am just especially looking forward to how much better it will work in baking. I thought the Webstaurant photo of this product showed one that was half-used, however, it does come this way, half-full. We weighed it on our kitchen scale and it is in fact 8lbs as advertised (+ more for container). We imagine this is done to make it easy to pour and prevent shipping mishaps. It arrived sealed under the lid, and all safe. 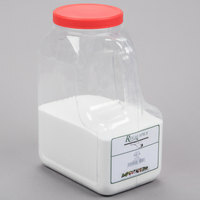 This salt has been a great find, it's easy to store and the container is nice and sturdy which I have reused. The salt is very fine. Very good salty flavor. Salt is decently fine grain. Perfect for many uses. Strong saltiness so not mush is needed. Little goes a long way. Our preferred salt. Should start selling larger quantities. I bought the cutest salt and pepper shakers with Webstaurant and this salt and pepper was much cheaper than my local grocery store. I had a ton left over to use for later too. I make all kinds of desserts with Sea Salt but alot more of salted caramel for my cheesecakes. The amount of sea salt you get here and the price is definitely a win! Once again, you really cant beat the price. the fine salt is really great quality and the amount you get is a lot. I use this product on the daily. We absolutely love the flavor of this salt. This is what we use on our French fries and the customers love it as well. Pours great out of a shaker. I love the sea salt. It was a great price for the bulk amount i recieved. I will continue ordering the herbs / seasonings that i need directly through you guys year round ! This Regal Fine Sea Salt is great for adding some salinity to your meal or recipes. Also a solution for filling up table shakers. Is as described. Will reorder. I make my own body scrub with this product. The packing makes it supper easy to use and reuse without making huge mess at the same time making it easy to store and keeping it fresh. A lovely bulk container from Regal that is bursting with wonderful quality and excellent flavor. Great for adding to any dish. The fine sea salt is strong so a little does. Great for adding great flavor to our pasta sauces. This is the most cost-effective way I have found of buying sea salt. We go through a lot of salt with all of our cooking, baking and brining and it is nice to be able to buy it in a big size. We love the fine sea salt in this 8 lb. container. Smooth, fine crystals. The taste is fresh and bright. Beautiful white, shiny crystals. We'll continue buying this! 4 stars! Super healthy and taste! Great quality and price! The the texture is very consistent. Great for cooking. Good for serving as seasoning too! Great salt, great price! I much prefer using sea salt because of the flavor it imparts, even in our baked goods. I tried the smaller size first & loved it, so now we purchase the 8lb package. The product is very nice and the grind is what we were looking for. Cost is a bit more than hoped for but sea salt generally is at least triple standard salt. This salt is a great product, with a great taste. Has a good consistency and I like being able to fill by shakers from the bulk container. Something you always need to keep in the kitchen! perfect for what I need. Nice fine salt at a great price...use it to make my handmade sea salt soaps and it works like a charm! I bought this salt for my wife and she loves it. She likes the fine cut sea salt, I'm more of a corse ground person myself. But it is still a great buy. Great product at a reasonable price! The only thing I wish is that the container would either be smaller, or full. Seems like such a waste to ship 1/2 full. FILL IT UP! Great quality sea salt! I rather cook with sea salt over others, it is a better alternative. This regal fine sea salt comes at a great price and quantity. I use this salt in my premium salt scrub products. My customers love it! It's very fine, so there isn't any need to grind it. This has the same flavor and texture as regular salt. Some people though enjoy that it is called sea salt so great to have for those. I buy this product in large containers now that I know it is as good as any fine sea salt I have used. Less intense flavor than regular table salt. I much prefer to cook with it. We require salt in some of our bread recipes.. We like purchasing the salt in bulk and know that we can get it here thru this website at a really good price.. Have purchased it several times and highly recommend it.. I purchased this coarse ground sea salt for use in my small home apothecary business - for use in small-batch salt/sugar scrubs and the like. I am very pleased with the consistency of this salt. It mixes very well in my recipes and the feedback I am receiving from customers is very positive. Great Sea Salt. it is very fine in size. Great flavor. We use it in many of our spice rub combinations and to top our fries. Great price! The sea salt was perfect and very well priced. We have used other name brands and this product was just as good! I will be reordering. We really like this sea salt. Its one of the best priced we have found and buying in bulk saves us money. Nice easy to handle container. Exactly what I needed, Salt is salt, more or less - and this is salt. But the price is great for the size and the packaging makes it easy to access.